Understanding how to properly measure a room can save the DIY homeowner both time and money. Don’t get caught underestimating the amount of material that is needed for a project and then add the hassle of making multiple trips to the store. This problem can be compounded if product has been special ordered that may take several days or weeks to arrive. Take a few minutes to correctly measure a room before ordering and eliminate this frustrating headache. On the flip-side, there is no need to overspend and end up with excess material sitting around collecting dust. The tools needed to correctly measure a room are pretty basic. All that is needed is a tape measure and a calculator. The principles of measuring a square or rectangular room are simple. It requires 2 steps. Choose two perpendicular walls (walls that intersect to form a corner) and measure the length of each. Use your calculator to multiply the two measurements. For example, a square or rectangular room that has one wall that measures and 8 feet long and a perpendicular wall that is 10 feet long will result in the follow equation. Thus, this room is 80 square feet. There are also online square footage measurement tools that can multiply these measurements. Got it? That was the easy part. What if the room isn’t square or rectangular? Irregularly shaped rooms can prove to be a bit of challenge. It is a counter intuitive to figure the square footage of a room that isn’t square. The way to do this is to divide the room up into several square sections. When the room has been divided up into several imaginary square sections, figure the square footage of each as we learned above. Once to total of each section has been figured, they can be added together. Begin by sketching a simple floor outline of the room. Next, cross-section the room and identify the square sections. Begin calculating each square section and adding it to the total until you’ve accounted for all of the floor space on the sketch. 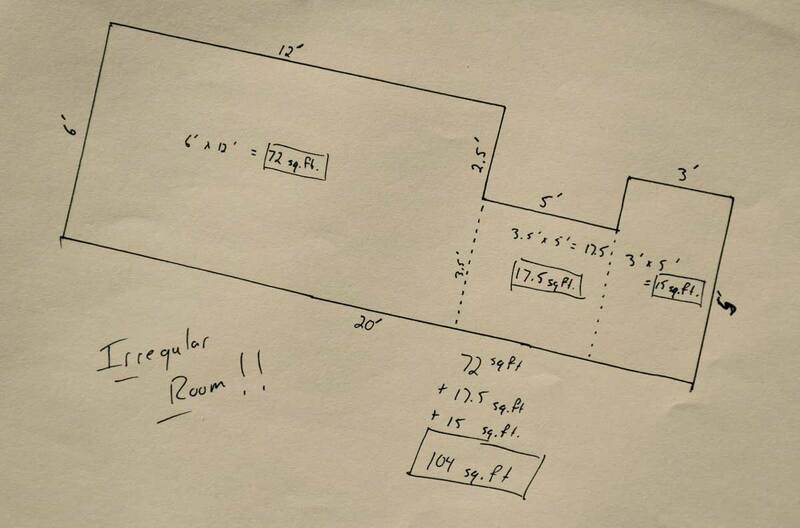 The steps outlined above are perfect for identifying how much material would be needed to complete a flooring project. One that included, say, new carpet or hardwood. Measuring a room in this way will not however, work to determine how much product is necessary for a project that involves wall coverings. New drywall, paneling, paint or wallpaper are a few examples. Measuring the square footage of the walls in a room utilizes the same principles, but in a slightly different way. To accurately measure a room for wall coverings we will use the length of the wall, and the height to the ceiling. The formula will be similar. 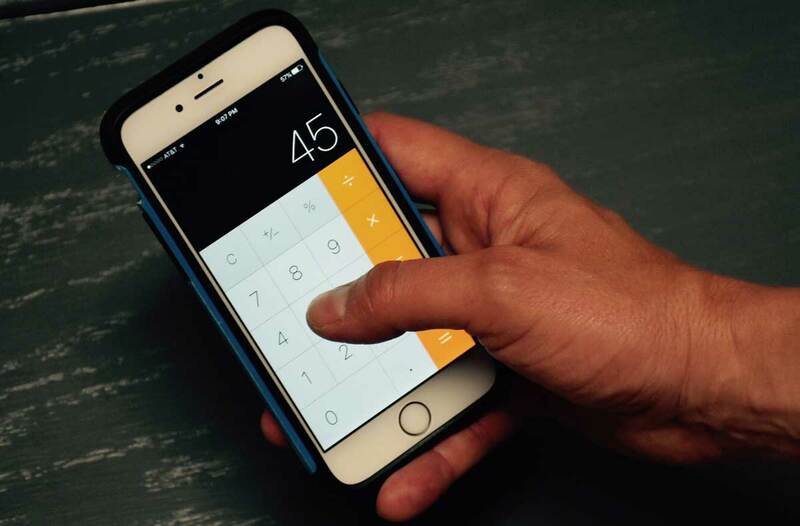 If, for example, the wall measures 12 feet long and 8 feet high, use the calculator to figure 12 feet × 8 feet and see that your wall is 96 square feet. 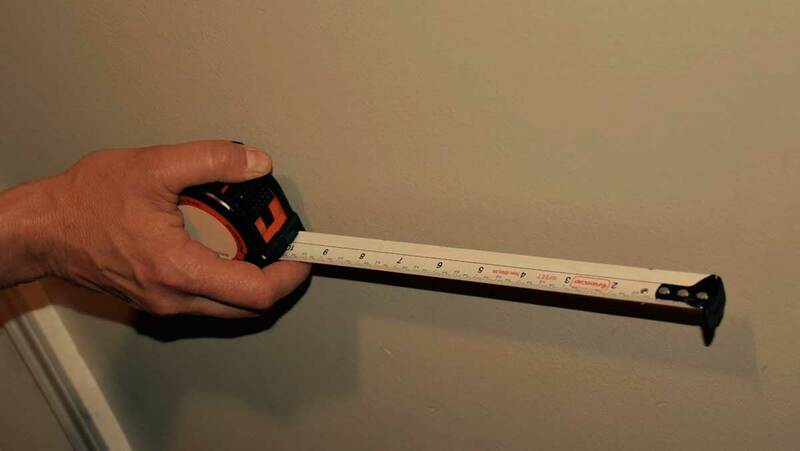 Repeat this process for each segment of wall in a room to accurately measure a room for any type of wall-coverings. As you make your way around your room, measuring the square footage of each segment, make sure that you note any doors and windows and subtract them from the total. An example might look like this. Our wall as noted above was 12 feet long and 8 feet high. However, right in the middle of that wall is a window that measures 3 feet across and 5 feet high. Using the same formula that we did for the wall, we will multiply 3 feet × 5 feet and learn that the window is 15 square feet. Now we will subtract that from the total square footage of the wall in order to see exactly how much paint, wallpaper, etc. that we might need. 96 square feet – 15 square feet = 81 square feet of actual wall space that will need to be covered or coated. Our wallpaper and paint calculators can help estimate wall covering materials after you’ve measured your walls. It may not seem like that will make much of a difference, but as you make your way through a house full of windows and doors, it can add up pretty quickly, sometimes making a difference in how many gallons of paint need to be purchased. By taking just a few minutes and using some very basic tools, you can accurately measure a room. Walk into your next DIY project confident that you have exactly what you need and focus on the job at hand, not stretching the last of your material to make sure that you have enough to finish.